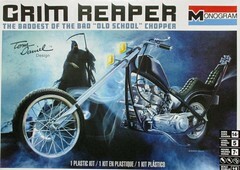 For the Modeler: This review covers the 2016 re-release of the Grim Reaper Chopper 1:8 Scale Monogram Kit #85-7541. It’s a Skill Level 5 kit for the advanced builder due to some intricate assembly but there are no decals in this kit.. This is a rerelease of the kit with a different box art from the original. Revell has also released this kit as the Harley Davidson Freedom Chopper. There are 80 pieces molded in white, chrome, clear, with black flexible tubing and black soft tires and very well laid out instructions. This is a replica of the 1974 Grim Reaper designed by Tom Daniel. This motorcycle has a coffin shaped fuel tank, a king and queen seat, and raked out tubular forks. The bike also has twin rectangular headlights, Goodyear tires and a Maltese Cross. This “old school” chopper is still awesome looking even 40 years after its original debut. Overall dimensions are~: Length 14¾”, Width 4”, Height 5¼”. Right On Replicas, LLC ©2017 All rights reserved. *All registered trademarks are the property of their respective brands. Follow the manufacturer’s safety recommendations for any product mentioned here.